Sticking to my winter theme of sea angling wherever I can find it, this piece is about fishing on the coast of Brazil. 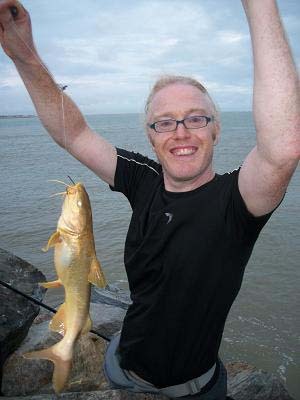 A couple of years ago my third son, Richard, emigrated to Brazil and, needless to say took his fishing gear with him. He's been pretty busy sorting out jobs, learning Portuguese and generally finding his way round. Currently he is living on the coast in a town called Aracaju and he has just begun to try and get to grips with the local fishing. Clearly it's not easy and here's his latest report -. As promised, here’s a little summary of my fishing progress over the last six months. After moving from central Brazil to the northeast coast in August last year I was really looking forward to doing some serious fishing. However, things didn’t exactly pan out as I had hoped. 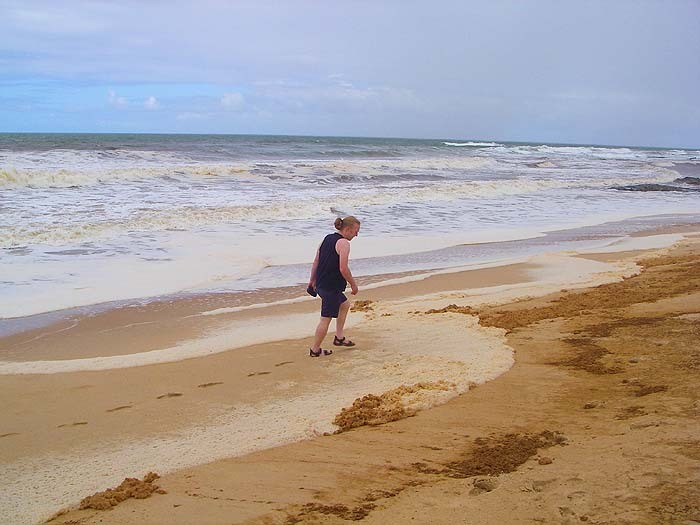 The first problem was the conditions – the beaches near where I live are enormous, featureless and have big waves rolling in all through the year. As a consequence the water is permanently churned up with a visibility of just a few centimetres.... so out go my favourite tactics of spinning or free-lining live/deadbait. The other big challenge is finding decent sized fish – the waters of northern Brazil are low in nutrients so they don’t sustain anything like the quantity of fish you see in many other tropical seas. However, judging by the big snook and snapper I’ve seen for sale in the local markets I know that there is some good fishing to be had. So, going against all my fishing instincts, I bought a couple of big grip leads (with wires attached to anchor the weight in the sand) and set up a simple paternoster using a circle hook baited with squid. I’m not much of a beach-caster, especially since buggering my shoulder last year, so I normally only fish 40-60 yards into the surf. On my first trip, and much to my amazement, I soon had a knocking bite which upon reeling in turned out to be a cute little catfish (or “bagre” as the locals call them) of about 8 inches. When I grabbed it to remove the hook the little &*&$ twisted and stabbed me in the wrist with a giant and razor sharp pectoral spine... Owwwww! Or words to that effect. I have since learned to treat this beautiful little fish with the sort of respect I normally reserve for barracuda, piranhas and their like....and that’s about it. I’ve also fished in estuaries, off the rocks into deeper water, at night, low tide, high tide, in the day surrounded by very scantily clad bathers, with prawns, with fish, all to the same general effect - small catfish. My best has been a golden catfish (a chunkier yellow species) of about 3lb while fishing of the rocks with a 6inch deadbait. I’ve also caught 5 or 6 other species of tiny fish (snapper, pilot fish, grunts) casting into the froth of the surf with tiny pieces of prawn. All very interesting, but hardly what I associate with tropical fishing! My next ploy is use some of these smaller species as live baits, at night, for rays – they all seem to be heavily armoured suggesting that something must like to eat them. 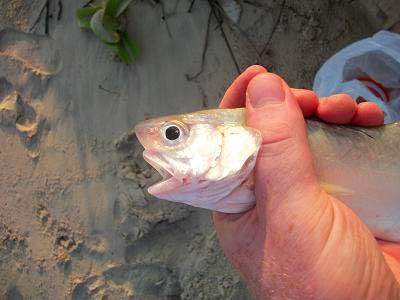 I’ve also come across several anglers fishing with 6-8inch (dead) mullet, these blokes claim they are after big snook. As yet I haven’t seen them catch anything but their persistence suggests that they must be successful from time to time. I’ve also seen some reasonable sized mullet in the estuary but they showed no interest in my baited spinner – I must try again with different bait. As you know I’m also moving further up the coast in a few months to where the conditions are totally different – most of the beaches have offshore reefs and bars so there is little surf and the water is pretty clear all year round. Ever the optimist, I’m already sharpening the hooks of my lures in anticipation. Well - there you have it. Needless to say Rich gets a fair amount of stick from me about the lack of decent fish but I'm sure that - (a) If there was anything decent to be caught he'd be catching it and (b) He'll be dead set on waving a picture of some monstrous fish under my nose as soon as he can. I'll keep you posted.